Fall is my favourite time of year. The weather is getting cooler and shorter days mean more cozy time on the couch. Growing up in New England, the leaves would be starting to change, the air would smell like cinnamon and every farm would have their Fall harvest on display – especially pumpkins. If you’ve ever tried to carve a pumpkin you know it’s a messy business. Before you can get creative with a knife you have to take out those slimy seeds and pulp. Speaking of knives, you really don’t need the extra stress of worrying that your five-year-old will chop off a finger. Plus, since it doesn’t really get that cold here, those rotting cut-up pumpkins are an open invitation to the entire neighborhood of bugs and creepy crawlies. Eww. 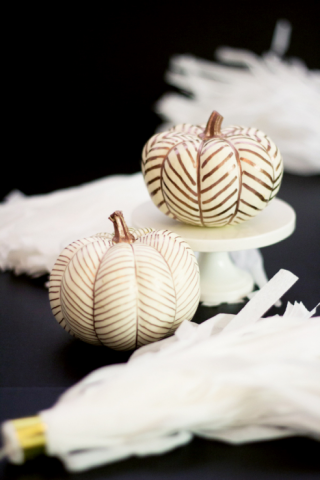 Thanks to the creativity of other people and the magic of Pinterest, I’ve put together eight great ideas for non-carved pumpkins. Don’t forget to Pin your favourites for later and click on the images to tutorials. Have you ever seen a more stylish pumpkin? Halloween may be a lot of fun for kids but that doesn’t mean that your pumpkins can’t be all grown up. These would look great in any adult space and I love the glamorous metallic touches. A paint pen is all you need! If you prefer your pumpkins fun and funky use acrylic paint in bright colours to give them a vibrant look then splatter with metallic gold for a bit of sparkle! Spooky! 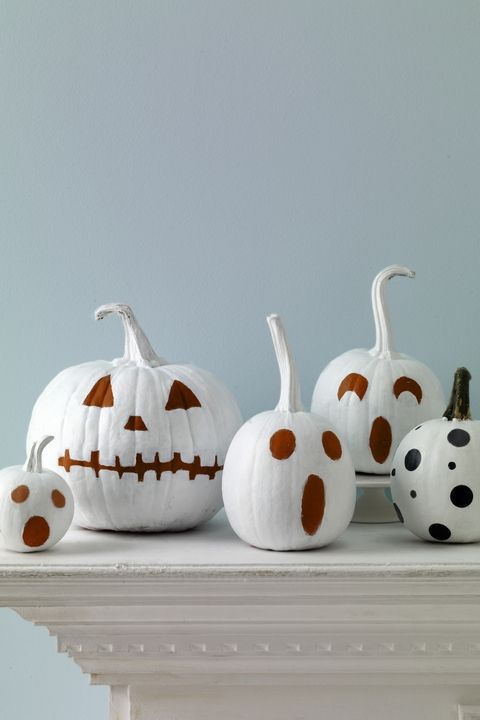 Instead of carving our scary faces, paint them and arrange on a mantle or the dining room table. It will make a fun centerpiece! 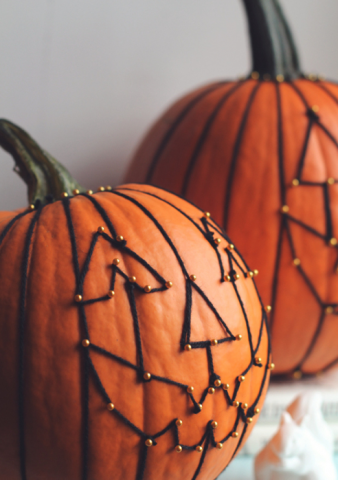 …or give your pumpkins faces made out of yarn. 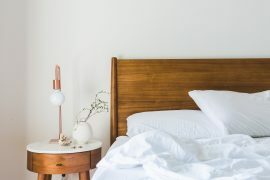 Use a cardboard cut out to plan your design, outline in pins or thumbtacks and connect the dots with string. 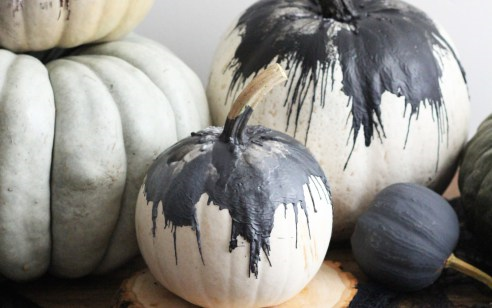 For another truly spooky Halloween pumpkin raid the crayon box for moody shades of black, grey and white. 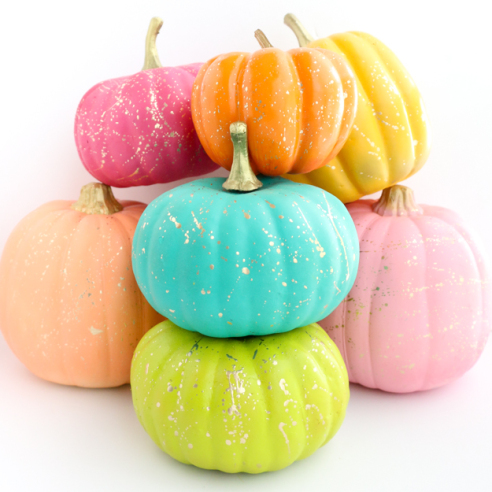 Cut the crayon in half (adult job), glue to the top of the pumpkin then melt with a blow drier. Do you have left-over nail polish? 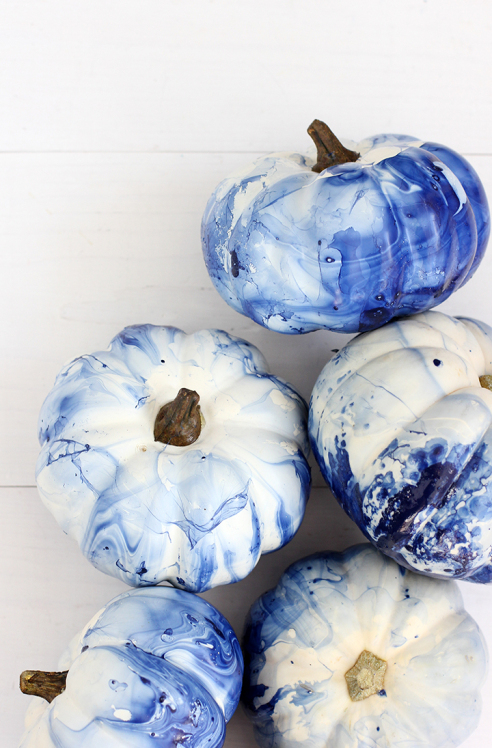 Here’s an easy tutorial to turn your pumpkins (the smaller the better) into marbled works of art. Husband has banned glitter at our house so use a little extra and think of me! 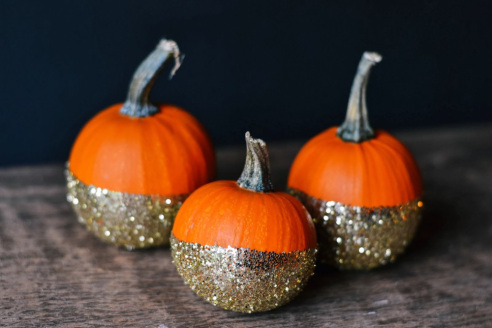 I can only imagine how these gold dipped pumpkins sparkle in the light. TIP: After applying glitter, spray your project with a clear sealer to make sure the glitter stays put and doesn’t make a mess all over the house. Mummy! Mummy! 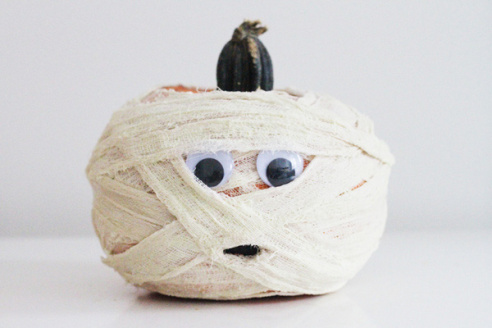 Wrap your pumpkin in gauze (or toilet paper! ), glue on a pair of eyes and voila!